Firefox 35 has been pushed to the Stable channel recently by Mozilla and while the majority of users did not notice any incompatibilities or issues, some users noticed that one or multiple of installed browser add-ons stopped working suddenly. This includes popular add-ons such as Ghostery or Adblock Plus among others. While the add-ons are still showing up as installed in Firefox, their functionality appears broken in Firefox 35. The icons they display are not there anymore for instance in the Firefox interface after the upgrade. Some users who noticed these issues reverted Firefox back to the last stable version while others tried to figure out why add-ons broke in first place. A user from the Adblock Plus forum posted a solution that fixes these issues in Firefox 35 but with a caveat. Mozilla changed the behavior of the Firefox preference dom.indexedDB.enabled so that it applies to websites, add-ons and session data instead of just websites as before. The issue with this is that setting it to false, the default is true, causes the issues with add-ons and session restore in Firefox. Type about:config into Firefox's address bar and hit enter. Search for dom.indexedDB.enabled and check its value. If it is set to false, double-click it to set it to true. Restart the browser and verify if the issues are gone. I have tested this with Ghostery and Adblock Plus and both stopped working after setting the preference to false and worked again after toggling it to true in the configuration. So what is dom.IndexedDB then? Mozilla notes that it is an API in the browser for client-side storage. It allows web services to save data on the local system and the only control that users have right now over it (apart from disabling it by setting it to false), is to change the warning quote preference. This won't help much however considering that the value is defined in Megabyte which means that the lowest value that you can set the preference to is 1 Megabyte. This in turn means that storage requests below the 1 Megabyte mark won't cause the prompt to appear. This is a privacy issue considering that Firefox does not provide controls currently to prevent data from being saved to Firefox. Mozilla seems to be aware of the privacy implications but it is unclear when the organization is going to address them. It is still possible to delete the data which you can do using one of the following options. Hit Ctrl-Shift-Del while Firefox is open. 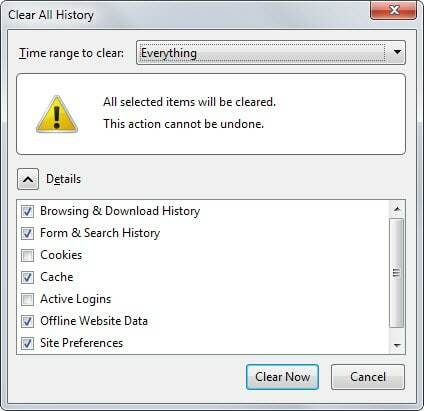 This opens the Clear All History prompt. Select Offline Website Data and Clear Now afterwards. The other option is to delete the data directly in the Firefox profile. There you find it listed by website that saved it in the browser in first place. Type about:support in the browser's address bar and hit enter. Click on Show Folder to open the profile folder. In the file manager that opened, switch to storage > persistent. Delete select or all folders there while Firefox is closed. You may also want to configure Firefox, or third-party programs like CCleaner, to remove the data regularly. Locate the History section on the page and switch to "Use custom settings for history"
Check "Clear history when Nightly closes". Click on settings next to it and make sure offline website data is checked. If you use session restore, make sure "Remember my browsing and download history" is checked. Some Firefox users noticed that add-ons stopped working in the browser after upgrading it to version 35. Find out how to fix that. I had noticed a folder in my profile always built/rebuilt after visiting a certain website, that folder is storage/persistent. Now I understand better why, and how. Mine is the reverse. My ‘Profile > Storage > Persistent’ folder is always empty, but Firefox keeps saving new sub-folders to my ‘Storage > Temporary’ folder: egs. facebook.com sub-folder, github.io sub-folder, etc. Contents include “metadata” & “module” files. The above temp files seem to stay there indefinitely, until I periodically delete them via Win Explorer. How to prevent FF from saving the above w/o my permission ? I don’t customize any site preferences for Facebook, GitHub, etc. The only site preference I configure is for Google Search, but FF doesn’t seem to store this anywhere. I often have to reconfigure the Google Search preference, because it keeps getting lost every 2 days or so. There is an ambiguity with the storage related to dom.indexedDB.enabled set to true and Clear All History/Offline Website Data. Theoretically setting browser.cache.offline.enable to false in about:config should prevent Web data from being stored in the user’s profile. It does, except for data sent to the Storage folder when dom.indexedDB.enabled is set to true (default) and true here is required for some plug-ins to work correctly. This is becoming rather complicated. The point now is that a user is obliged to accept offline data with dom.indexedDB.enabled set to true otherwise some plug-ins won’t run correctly. I am starting to be fed up with a company’s policy which seems to add one feature after another without a global logic. 1- I include the Storage folder in CCleaner’s Options/Include as a folder to delete, folder’s content and folder itself. The Firefox 35 update broke Firefox for me. I had to go to safe mode, remove all add-ons, restart Firefox, and then add them back, one-by-one, to make certain they worked. I wasted between 45 minutes and an hour due to Mozilla’s need to constantly change Firefox. Firefox 35 also reset my default search engine back to Yahoo, which I dislike, from Google, which is my preference. Mozilla went from being too slow to too fast in updating the software. They are making me rethink Google Chrome vs. Firefox. Although I prefer Firefox, I never have issues like the above with Chrome’s behind the scenes updates. To borrow a hackneyed phrase from Apple, Chrome just works. Sadly, not so much for Firefox anymore. Of course the grass is always greener on the other side. If you don’t like “putting up” with potentially-breaking changes as often, then switch to the ESR release or just move on to Chrome already and struggle to put up with their flaws. People think it’s so much better in Chromeland, but that’s only because they haven’t been there as long. Besides, if more people bothered to help Mozilla test their software before it was released, then these issues wouldn’t come up as often. It’s easy to get annoyed by it, but if nobody helps find the issues then Mozilla just has to risk breaking things this way if they’re going to keep improving it. If the costs of that are just too great, nobody is twisting your arm to keep using Firefox. It’s more fixing issues than finding issues which causes, well issues ! At least for such cases. With this tool, you can backup and restore your “bookmarks, mail, contacts, history, extensions, passwords, cache etc.” – not only for Firefox, but most of the other Mozilla-based programs. If an update “breaks” your version of Firefox, you can completely remove (uninstall) the update, download and re-install a fresh copy of the previous version, and then “restore” all the stuff you backed up from your previous working version. Not only that, but you can selectively choose which parts you want to restore – such as only your bookmarks or only yur extensions. I run a backup just about every time there is a major update to Firefox – and it has proved to be invaluable and saved my a** on more than one occasion. Last stable version March 2011, last beta version May 2012. Hmmm…. Excellent advice for all you readers. I too have used the MozBackUp program for a couple of years. It saved my bacon again with this cr*ppy Firefox 35 version that killed my online video playback and refused to let me update my Adobe flash player through Mozilla’s add-ons website, caused Google to endlessly ask me if I wanted it as my default browser (yes, I made all the correct changes in Firefox 35 to have it as default) and killed several add-on programs. Don’t say you weren’t warned. Save yourself days, weeks or months of re-work and get this incredibly fast. free and easy to use Firefox backup program. I didn’t have any problems when I updated to 35. I have local storage disabled. I don’t use cache at all. I use ABE instead of ABP. I use Priv3+ and Self-Destructing Cookies. I have about 30 other extensions (good ones, that don’t ruin the browser). It’s very rare that a page doesn’t work perfectly. Strange, I’ve updated Firefox to 35 in 4 different machines (2 Linux Mint, 1 Manjaro (Linux) and 1 Windows 7) and all my add-ons, including AdBlock Plus and Classic Theme Restorer continue to work fine–icons present. Go figure. By the way, in order to have the “Clear browser history” box appear at the close/restart of the browser ( a function Mozilla removed years ago) just install the “AskForSanitize” add-on for Firefox. Works fine with version 35. The issues only happen if you have set the preference to false in Firefox. Is that the case on your system? So you’re saying this issue probably applies to more technical users who had manually changed that pref? Yes that is how I understand it. Mozilla did not switch the pref to false during the upgrade and my best guess is that it has been set to false by privacy conscious users who did not want sites to write data to their local system using the feature. I just checked and “dom.indexedDB.enabled” is set to True which is obviously the default value. This explains why I haven’t had a problem then. I’ve been known to play with a preference or two in about:config in my time but I also know that it almost always bites you in the hind end sooner or later. These days I just leave well enough alone. Except for changing “browser.tabs.maxOpenBeforeWarn” from a ludicrous 15 to more sane 2 that is. The Offline data cache clear also fixed my sync issues. Thanks a lot… it was driving me crazy. I’ve give up on Add-ons after the v34 update, removed about four or five Add-ons and won’t be updating the browser for awhile. The Add-ons I use are AdBlock Plus, Copy As Plain Text, Menu Wizard, Save to File, WOT and Xmarks. Also is there anyway Martin you can tell me why Firefox has HTTPS: problems, When visiting Newwegg or another site that supports HTTPS for that matter, Firefox reports there’s content been blocked and did some digging when it started happening on my blog. WordPress support aka the community were telling people to update the .php file something I have no access to because I didn’t purchase the theme. Using Internet Explorer HTTPS works just fine. P.S please don’t judge my blog still trying to learn CSS/HTML before I decide to purchase the theme. I don’t have issues visiting your site. You may get the warning because of mixed content being loaded on your site meaning that some contents are loaded using https while others using http. I use Adblock Plus and Menu Wizard without issue on 35. Since updating to Firefox 35, “Ask to activate” no longer works for Flash. When I want to view a Youtube video, either nothing happens when I click on the “play now” text on top of the solid dark grey rectangle, or the text is missing altogether and clicking also doesn’t do anything. Youtube vids play, however, when I change the setting to “Allow always”. Anyone else having this problem besides me? Have you checked if permission prompts are displayed at the top of the window? When I visit YouTube I get the “activate Adobe Flash” text in the video area, and when I click on it, sometimes nothing happens. The only option to play the video then is to right-click and select activate this plugin or click on the activation icon on the left side of the url. This is then set for the session though. Thanks but the narrow “permission prompt” line at the top of the window does not appear. Right-clicking on “activate this plugin” has no effect. The only icon to the left of the url is a lock, the puzzle-piece shaped icon does not appear. I suppose I can live with changing the setting for Flash to “always activate”, as long as I keep Flash and the browser current with security updates. When I visit youtube – I get this error::: AN ERROR OCCURED, PLEASE TRY AGAIN LATER, LEARN MORE. White text over black video screen… essentially video snow (how oldschool). Thanks Firefox 35! You’re the best. I’ve had that happen with YouTube a couple of times in the past couple of years or so (the “snow”) but it was always a problem at YouTube’s end, not with Firefox. If you want to check to make sure and you have Google Chrome installed you could check YouTube with that or you can start Firefox in Safe Mode (with all Add-ons disabled) and see what happens. For myself, I don’t have a problem using YouTube with Firefox 35 either with Flash or HTML5. Martin, I really wish I could subscribe to just replies to my own comments rather than all or nothing for the post. I don’t think there is an plugin for it that can do it. I know that third-party solutions like Disqus can though. I have three folders: storage/persistent/moz-safe-about+home, storage/temporary/chrome and storage/temporary/https+++mega.co.nz, which don’t get deleted after clearing all Offline Website Data with the Firefox prompt. —moz-safe-about+home seems to be related to the snippets, and it might make sense that it isn’t deleted. There’s a idb (indexedDB?) folder inside it. —chrome seems to be related to Firefox (I guess? ), and it might make sense that it isn’t deleted. There’s a asmjs folder inside it. —But what about that https+++mega.co.nz folder? I have a Mega add-on, though disabled most of the time (and it has been disabled for a long time now), so it could be related to that. There’s a asmjs folder inside it. Given those idb and asmjs folders, it seems storage/persistent is indeed related to indexedDBs, and storage/temporary isn’t. Anyway, I didn’t have any other folder in storage/persistent or storage/temporary apart from the ones cited above, so I can’t tell if Firefox really cleans anything inside the storage folder. 1. Can you really assure me that Firefox deletes indexedDB storage with the Clear All History prompt? I wouldn’t mind having indexedDBs enabled if that were the case. 2. Are the contents inside storage/temporary related to indexedDB? 3. Why doesn’t Firefox delete those three folders of mine? Well, it seems I should have read Tom Hawack’s replies. There are still some loose ends though. Are there submitted bugs about this? Because I want to delete ALL Offline Website Data if I select that option. And I also have browser.cache.offline.enable set to false, which seems useless as Tom Hawack says. @Name — “browser.cache.offline.enable” is not related to “storage\persistent” or “storage\temporary” folders. From what I observed, if “browser.cache.offline.enable” is set to false, Firefox doesn’t store stuff in the “profile\cache2” folder. The cache2 location can be changed, eg. I configure mine to be located in the Windows’s “Temp” folder. @Name — I don’t have any Mega add-on, but I can definitely make FF spawn the “https+++mega.co.nz” subfolder in my “storage\temporary” everytime simply by landing on the mega.co.nz homepage. The mega subfolder is generated after the “M cloud” logo finished loading. (Before the M logo & associated background webpage processes finished loading, there is no mega subfolder.) Its contents include a nameless “.metadata” file extension & an “asmjs” subfolder containing an extensionless “metadata” file, as well as multiple extensionless “moduleXX” files. Attempting the above again just now, I can verify that FF spawns & respawns the mega subfolder in “storage\temporary” regardless of whether “dom.indexedDB.enabled” is set to true (default) or false. So either “dom.indexedDB.enabled” is totally not related to “profile\storage”, or there is a bug. On the other hand, I don’t know how to respawn the “https+++www.facebook.com” subfolder on demand. No related subfolder was created just now, when I landed on the Facebook homepage or after logging in/out. “Cached Web Content > Clear Now” doesn’t remove stuff from “profile\storage”. Previously in mid-Dec 2014, I manually deleted the mega subfolder (along with “https+++www.facebook.com” etc. etc. etc. subfolders) from “storage\temporary”. No adverse effects observed so far. My “Offline Web Content & User Data” always shows 0 bytes w/o me having to do anything. Meanwhile, Firefox has never stored anything in my “storage\persistent” folder. The behaviour of mega.co.nz is the very same here. I don’t know about Facebook because I don’t have an account there and I don’t visit the site either. Try going to about:home (Firefox default start page) and the storage/persistent/moz-safe-about+home folder should appear. It seems nothing else creates folders or files inside storage/persistent as far as we know. Firefox is either deleting this data or it isn’t. And it clearly isn’t. Since ‘upgrading’ from firefox 34 to 35 flash quit working. Now when I go to youtube all that shows up is a black box where the videos used to play. When I go to the adobe to test my current flash version flash doesn’t appear at all on the page where it used to indicate the version number. My current flash version is 16.0.0.257 as shown in the firefox plugins window. Unfortunately I’ve been having to use Chrome until there’s a fix. Also the value for dom.indexedDB.enabled is true so this is not the issue. Check that in Add-ons -> Plugins, Shockwave Flash is set to ‘Always activate’ instead of ‘Ask to activate’ or ‘Never activate’. The same exact thing happened to me as well. The value for dom.indexedDB.enabled is true, I’ve just updated Shockwave Flash to 16.0.0.257, and I made sure to set it to ‘Always activate’. Yet, only black boxes show instead of flash content. @Pierre999 / Marcan — If the video shows just an unresponsive black screen, something in the exisitng Flash folder at your profile might have become corrupted. Try deleting the below 2 “Flash Player” folders via Windows Explorer. For the 1st one, make sure not to delete the main Adobe folder by mistake. Flash Player will recreate these folders after you reload the Flash video webpage. Thanks. However I tried that, rebooted, and still no luck. If your Flash plugin is working, it should load the ‘Settings Manager’ panel (which is in Flash form), & you would see the ‘Global Storage Settings’ tab. Here, make sure this is ticked: Allow 3rd-party Flash content to store data on your computer. If you see ThirdPartyStorage = 0, delete it & save the cfg file. This pref is known to cause an responsive black screen for Flash videos that require local storage of 3rd-party Flash cookies. That didn’t work either, the Settings Manager panel did not appear at all. I should have mentionned that I was getting a black screen on youtube (right-clicking was not showing me info about flash player) but everywhere else I didn’t see the Flash content at all. I finally solved the problem simply by reseting Firefox’ preferences to default through here: https://support.mozilla.org/en-US/kb/reset-preferences-fix-problems. Flash Player works like a charm now, the only minor weird thing is that right clicking on a youtube video now causes the plug-in to crash. Oh well. @Marcan — Since resetting Firefox’s preferences allows the loading of Flash, it suggests that there could have been at least 1 setting in about:config (stored in prefs.js) that was recently changed by an add-on or manually. If you backed up your old prefs.js file, you can do a cross-comparison to see which are the pref(s) that conflict with Flash. The new Firefox 35 was (auto-) downloaded on my pc yesterday… I have not been able to use Firefox since – period! I am unable to search or open ANY page. It eventually times out and quits. I can use Chrome and/or Internet Explorer just-fine. It cannot seem to attach to any page. I’ve tried rebooting with no change. I checked the dom.indexedDB.enabled mentioned above and it is set to true. (I did use Ghost). I’m ready to uninstall it and go back to the older version or just get by with Chrome. I went through something similar (perhaps identical) on two machines (so far). My solution was to launch Firefox in safe mode (hold down the Shift key when clicking on the Firefox icon). Make a note of all your installed add-ons. Then remove them all and restart Firefox regularly. Reinstall the add-ons one-by-one, restarting Firefox each time to make certain the add-on works. This worked fine for two computers (so far). It is time consuming and tedious but it worked. • mega.co.nz’s M-in-cloud logo does not load. No “https+++mega.co.nz” subfolder spawned in “storage\temporary”. • Error msg: “Sorry, we were unable to initialize the browser’s local storage, either you’re using an outdated browser or it’s something from our side. […] Reason: localStorage is null“. • Mega redirects to mega.co.nz/update.html, asking user to update FF or switch to compatible browser (ie. current version of Chrome or Opera; IE & Safari only partially supported). • mega.co.nz’s M-in-cloud logo loads, but rest of page does not load; page is blank (except for M logo) & non-functional. • “https+++mega.co.nz” subfolder (with metadata & module contents) spawned in “storage\temporary”. • No error msg, user left stranded at non-functional mega homepage. • mega.co.nz’s behaviour identical to SCENARIO 1. Meanwhile, setting “dom.storage.enabled = false” &/or “dom.storage.default_quota = 0” does not prevent FF from creating the “moz-safe-about+home” subfolder in “storage\persistent” when user visits about:home. Maybe dom.storage.enabled also changes the value of dom.indexedDB.enabled, because indexedDB is a type of local storage after all. If it doesn’t change the value of dom.indexedDB.enabled, then it rules over it, which is basically the same. Anyway, I discovered why I had dom.indexedDB.enabled set to false, which caused the problems described in this Ghacks article. I didn’t remember changing it directly in about:config. I’ve changed many about:config entries, but this one I knew I hadn’t. I even created a new Firefox profile and configured Firefox in both the options pop-up and about:config in the same way as my default profile (what I could remember; most of the important changes appeared in the user.js of my default profile, though, so I recreated pretty much everything), and then installed most of the add-ons of my default profile; all of this in order to see if any of those changes set dom.indexedDB.enabled to false. But nothing of that changed it to false. However, today I finally discovered what I had done that set the entry to false. If you go to about:permissions and select All Sites, and then change Maintain Offline Storage from Always Ask to Block, then dom.indexedDB.enabled changes to false. If you set Maintain Offline Storage to Always Ask, dom.indexedDB.enabled changes to true. I indeed remember changing this, because I don’t want any offline storage and I happened to see this option there in about:permissions. Extremely funny how even if it’s set to Always Ask, IT DOESN’T F*CKING ASK when it maintains Mega offline storage, for example. @Name — Based on my trials, the ONLY way to prevent Mega from storing offline data at “storage\temporary” is to set dom.storage.enabled = false. But this totally breaks Mega as well. Perhaps the reason why Mega doesn’t “ask for permission” is because its web processes do not trigger dom.indexedDB.enabled in the first place ? Is it not plausible that Mega seeks to store data offline (ie. dom.storage.enabled = true which would enable its mysterious proprietary download manager to work), but sees no need to index the temporary data storage for high-performance searching ? In other words, not only is it not necessary to index the files related to the download manager, Mega also doesn’t seek to index whatever extraneous files you might have in the mega sub-folder because it doesn’t care to know. On a related note, dom.indexedDB.enabled (=> About:Permissions > Maintain Offline Storage) is not tied to Tools > Options > Advanced > Network > Offline Web Content & User Data: “Tell me when a website asks to to store data for offline use”. For instance, I can tick this option (imply: Always Ask), but simultaneously retain dom.indexedDB.enabled = false (false: Block; default true: Always Ask). And vice versa. So it does seem that dom.indexedDB.enabled is tied to **search-indexing** of offline storage (if this exists), as opposed to allowing/ disallowing offline storage per se. in the article, it says that you can delete the contents of the “storage”/”persistent” folder.. however, when i look in that folder, the only thing i see there is one folder, named “moz-safe-about+home”.. i am not sure if that should be deleted, or not.. for all i know, that could be something that is used by the firefox browser, as opposed to its being “temp”-data that was generated by viewing a website.. If you are unsure, back up the folder, delete it and check if you notice any issues. If you don’t, delete the backup and if you do, move it back. I don’t think you should notice any issues deleting it though. @redwolfe_98 — If you were to delete the “moz-safe-about+home” subfolder from “storage\persistent”, FF recreates it as soon as you visit about:home. The “moz-safe-about+home” subfolder doesn’t exist if the user has never visited about:home. From my experience, its absence has no adverse impact on FF’s function or performance. On the other hand, if “moz-safe-about+home” exists AND there are associated bugs, you might be affected if you use about:home. For instance, “moz-safe-about+home” stores snippets for about:home. There were previous bugs wrt these snippets, causing FF to hang at about:home for users who had configured this as their homepage. The solution requires the aforementioned affected users to delete their “moz-safe-about+home” folder in order to remove the stored buggy snippets. (See below.) Assuming the user accesses about:home again, FF will fetch new snippets to the (recreated) “moz-safe-about+home” within the next 24 hours. Many thanks for reporting this! It also solves the problem for me that tabs were not restored anymore. Can anyone check their /profile/cache2/ folder to see if they have any folders with the prefix “trash”? I seem to get hundreds to thousands of empty “trash” folders when running Firefox 35. I think it’s a bug. @Ray — The old bug that caused the build-up of empty cache.trash##### / cache2.trash##### folders — whenever FF was opened & closed (or crashed) within 90 secs — shouldn’t exist in Firefox 35 stable, although it continues to affect FF 31.x ESR releases. Did you happen to have “upgraded” directly from FF 31.x ESR to FF 35 by switching channels (eg. via editing about:config & prefs.js), instead of installing FF 35 afresh ? Thanks, Firefox 35 broke Ghostery, Add Block Edge and Battlefield 4 here. youtube video replay also stopped working. I hate it when they do this. Why always change everything when it works. i upgraded from firefox 26 but i’m going straight back. Damn ugly GUI, add on bar gone, firefox is trying to look like Chrome now. To Mozilla : test test test before release release release!!! FEBE addon does a good job of backing up bookmarks, contacts, , extensions, passwords, e.t.c. This also causes issues with sites like Weather Underground which won’t be able to display most of its data. In something like firebug you’ll see “InvalidStateError: A mutation operation was attempted on a database that did not allow mutations” (http://s12.postimg.org/z3peqpc19/wunderground_js_errors1.jpg). Well, I just proceeded the other way ’round when I discovered that, in about:permissions setting All sites / Maintain Offline Storage to Block would prevent offline storage for sites that use it, also that setting above to Always Ask would in fact never ask. I compared my prefs.js with and without above setting set to Block and discovered dom.indexedDB.enabled set to false when All sites / Maintain Offline Storage was set to Block … Web search then lead me to this page… which I hadn’t fully integrated apparently when I first read it back in January! I’m keeping dom.indexedDB.enabled to false, I have at this time no issue with whatever add-on, but I do with two sites at this time which require the related Offline Storage to run correctly. I’ve closed accounts on those two sites. SITES DO NOT NEED TO STORE THEIR DATA ON MY COMPUTER. Period.